As the US-NATO military alliance continues its deployments along Russia’s borders, including the US-UK supported Joint Viking 2017 exercise in Norway that began on March 1 and the deployment of more US troops in Poland “from the start of April, as the alliance sets up a new force in response to Moscow’s 2014 annexation of Crimea,” the campaign by the US and British governments against alleged “Russian Aggression” continues to increase in volume and intensity, aided by an ever-compliant media. Of course it would be impossible for the Senators to revise their rabid hatred of Russia and overcome their dismal pride to acknowledge that on March 1 the US National Reconnaissance Office launched a spy satellite carried by an Atlas V rocket that was powered by a Russian RD-180 engine. In an astonishing example of petty-minded obfuscation, the 1,500-word official report on the launching mentioned RD-180 three times — but failed to state its country of manufacture. The mainstream media followed suit. There was to be another Atlas V launch in March, carrying supplies to the International Space Station, but it was delayed by “a hydraulic issue that was uncovered on ground support equipment required for launch.” Had it been deferred because of malfunction of the Russian engine that powers it, there would have been gloating headlines. There should be no surprise about the activities of US and British intelligence agencies, because they already have a proven record of spying on UN Secretary General Kofi Annan, Chancellor Merkel of Germany, French Presidents Jacques Chirac, Nicolas Sarkozy and François Hollande and Brazilian President Dilma Rousseff, to name but a few world leaders subjected to the indignity of greasy little eavesdroppers sniggering at their private conversations. Although none of the assertions that Russia has been conducting a cyber war against America can be substantiated, Washington’s anti-Russia propaganda campaign will continue for the foreseeable future, while President Trump’s initial intentions to enter into dialogue with his counterpart in Moscow wither away to nothing. Even if he does resurrect the sensible policy he seemed to endorse, his acolytes in Washington will do their best to maintain confrontation by spreading more allegations of Russian “aggression” and “cyberattacks.” The anti-Russia campaign is gathering force, and it is not difficult to put a finger on why such a counter-productive crusade appeals to so many in the West. The US arms and intelligence industries are the main beneficiaries of confrontation with Russia, closely followed by the hierarchy of the defunct US-NATO military alliance who have been desperately seeking justification for its existence for many years. For so long as the military-industrial complex holds sway in Washington, there will continue to be sabre-rattling and mindless military posturing. But the International Space Station will continue to be resupplied by rockets powered by Russian engines. Dear Senator Klobuchar, I write with concern over statements you have made recently regarding Russia. These statements have been made both at home and abroad, and they involve two issues; the alleged Russian hack of the presidential election and Russia’s actions in the aftermath of the February 22, 2014 coup in Kiev. U.S. intelligence services allege that President Vladimir Putin ordered an influence campaign to denigrate Hillary Clinton and help elect Donald Trump. The campaign is purported to include the production of fake news, cyber-trolling, and propaganda from Russian state-owned media. It is also alleged that Russia hacked the email accounts of the Democratic National Committee and Clinton campaign chair John Podesta, subsequently providing the emails to WikiLeaks. Despite calls from many quarters, the intelligence services have not provided the public with any proof. Instead, Americans are expected to blindly trust these services with a long history of failure. Additionally, the former Director of National Intelligence, James Clapper, and the former Director of the Central Intelligence Agency, John Brennan, have both been known to lie to the public and to Congress, Mr. Clapper doing so under oath. Meanwhile, WikiLeaks founder Julian Assange maintains the emails did not come from Russia (or any other state actor) and his organization has an unblemished record of revealing accurate information in the public interest that would otherwise remain hidden. While responsible journalists continue to use the word ‘alleged’ to describe the accusations, Republicans with an ax to grind against Russia, and Democrats wishing to distract from their own failings in the campaign, refer to them as fact. Indeed, on the ‘Amy in the News’ page of your own website, Jordain Carney of The Hill refers to the Russian meddling as “alleged”. A congressional commission to investigate the alleged Russian hacking is not necessary. Even if all the allegations are true, they are altogether common occurrences, and they certainly don’t rise to the level of “an act of aggression”, “an existential threat to our way of life”, or “an attack on the American people” as various Democratic officials have characterized them. Republican Senator John McCain went full monty and called the alleged meddling “an act of war”. 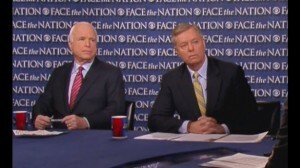 It is of concern that you would join Senator McCain and the equally belligerent Senator Lindsey Graham on a tour of Russian provocation through the Baltics, Ukraine, Georgia, and Montenegro. The announcement of your trip (December 28, 2016) on the ‘News Releases’ page of your website renewed the unproven claim of “Russian interference in our recent election”. It also claimed that the countries you were visiting were facing “Russian aggression” and that “Russia illegally annexed Crimea”. It is unfortunate that these claims have become truisms by sheer repetition rather than careful examination of the facts. Russia has not invaded eastern Ukraine. There are no regular units of the Russian military in the breakaway provinces, nor has Russia launched any air strikes from its territory. It has sent weapons and other provisions to the Ukrainian forces seeking autonomy from Kiev, and there are most certainly Russian volunteers operating in Ukraine. However regrettable, it must be remembered that the unrest was precipitated by the February 22, 2014 overthrow of the democratically elected president Viktor Yanukovych which, speaking of meddling, was assisted by U.S. State Department, other American government agencies, and one Senator John McCain. The subsequent military and paramilitary operations launched by the coup government against the People’s Republics of Donetsk and Luhansk were described by President Putin as “uncontrolled crime” spreading into the south and east of the country. In American parlance, both the interim coup government in Kiev and the current government of President Petro Poroshenko have engaged in “killing their own people”. If Russia’s actions are to be considered “aggression” or an “invasion”, one must find a whole new word to describe what the United States did to Iraq in 2003. If, like your colleague Senator McCain, you hold the annexation of Crimea to be illegal under the 1994 Budapest Memorandum, I urge a closer look. On February 21, 2014, an agreement brokered by the European Union was signed between President Yanukovych and the leaders of three major opposition parties. The agreement contained terms for a cessation of violence, immediate power sharing, and new elections. Smelling blood in the water, the opposition in Maidan Square did not withdraw from the streets or surrender their illegal weapons as agreed, but instead went on the offensive. Yanukovych, under threat to his life, fled Kiev along with many others in his Party of Regions. Nor did the opposition party leaders honor the agreement. The next day, they moved to impeach Yanukovych, however they failed to meet several requirements of the Ukrainian Constitution. They failed to indict the president, conduct an investigation, and have that investigation certified by the Constitutional Court of Ukraine. Instead, they moved directly to a vote on impeachment and, even on that count, they failed to obtain the required three-fourths majority vote. So, even though the Budapest Memorandum did offer assurances of Ukrainian security and territorial integrity in exchange for surrender of Soviet-era nuclear weapons on its soil, the sovereign government of Ukraine had fallen in a violent unconstitutional putsch. Yanukovych remained its legitimate president-in-exile and he, along with the prime minister of the Autonomous Republic of Crimea, requested Russian intervention on the peninsula to provide security and protect the human rights of ethnic Russians threatened by the new coup government and neo-Nazi elements within it. One can now see how real that threat was by looking to eastern Ukraine where the Ukrainian military and neo-Nazi paramilitaries such as the Azov Battallion, have moved with force against the defenders of the Donbass region whose people seek autonomy from a government in Kiev that they do not recognize. Approximately 10,000 people have died in the Donbass War, whereas only six people were killed during the period of annexation (February 23-March19, 2014) in Crimea. While the Donbass War drags on, Crimea remains stable today. The popular referendum conducted on March 16, 2014 lent legitimacy to the subsequent annexation. Official results claimed 82% turnout with 96% of voters favoring reunification with Russia. Independent polling conducted in the early weeks of March 2014 found 70-77% of all Crimeans favored reunification. Six years prior to the crisis in 2008, a poll found that 63% favored reunification. Even though many ethnic Ukranians and Tatars boycotted the election, rejoining Russia was clearly the will of the majority of Crimean people. President Putin, characterizing the situation in Ukraine as a revolution, claimed that Russia had no agreements with the new state and therefore no obligations under the Budapest Memorandum. He also cited Chapter I: Article 1 of the United Nations Charter, which calls for respect for the principle of self-determination of peoples. The 1975 Helsinki Accords, which affirmed post-World War II borders, also allowed for the change of national boundaries by peaceful internal means. The United States should accept the Russian annexation of Crimea both as a pragmatic matter, and one of principle. In 1990, during negotiations for the re-unification of Germany, the United States promised that there would be no eastward expansion of NATO. That promise has now been broken three times and eleven new nations have been added to the alliance. Ukraine has also entered in partnership with NATO, and at various times, full membership has been discussed. Russia has consistently expressed its disapproval. According to your website, an objective of your trip was “to reinforce support for NATO”. If this weren’t provocative enough, your three-senator delegation went to a front-line military outpost in Shirokino, Ukraine to incite an escalation to the Donbass War. Senator Graham told the assembled soldiers “Your fight is our fight, 2017 will be the year of offense”. The leader of your delegation, Senator McCain, said “I am convinced you will win and we will do everything we can to provide you with what you need to win”. After the speeches were given, you are seen in a video of the New Year’s Eve event accepting what appears to be a gift from one of the uniformed soldiers. With all of the furor over former National Security Advisor Michael Flynn’s resignation, and possible violation of the Logan Act, for discussing alleviation of sanctions with a Russian ambassador, this appears to be a far more serious offense. Not only did your delegation advocate for a foreign policy that was not aligned with that of acting President Obama, it was also contrary to President-elect Trump’s approach to the region. And the results of your advocacy have the potential to be far more deadly than the mere alleviation of sanctions.